Soul Mate Publishing Launch Party and Blood and Kisses Releases!! October 11, 2011 October 12, 2011 karinshah21 Comments on Soul Mate Publishing Launch Party and Blood and Kisses Releases!! Meanwhile, as is posted else where on my site. I will giving away a free e copy to a commenter between 12 am 10/12/11 and 12 am 10/12/11, so please, feel free to weigh in! Since I have the blurb elsewhere in the site, here’s a little interview with the hero of BLOOD AND KISSES, Gideon Damek. Hi Gideon, thanks for coming. I hope you don’t mind if we dive right in and I ask you to tell a little bit about yourself. I was born in Mesopotamia before it was Mesopotamia. My father was a King, but my status as his heir was hotly contested. I was sickly and they didn’t think I’d live. My father sent me to travel with his armies as soon as I was old enough, ostensibly to toughen me up, but probably to get me out of the way. I had to stay on my toes at all times. There were many ambitious men who would have liked to see me out of the way, permanently. Sounds like a hard childhood. I survived. But that was a very long time ago, after that I hired out as a mercenary. But you weren’t born a vampire…? No, but I prefer not to go into that right now. Ok, fair enough. How about something more recent. How did you come to live in Rochester, NY? I moved to America in the nineteenth century. I decided to travel West. Rochester was flourishing and despite the long summer days, it was overcast enough to make getting around tolerable. So you don’t have to sleep during the day? Young vampires do, but I can get along well enough if I stay out of the sun. Were you the only vampire in Rochester? No, eventually a whole community developed. That must have been nice. You’d think, but I’m not exactly a joiner. As the oldest, it was my job to enforce the code. It’s easier to destroy someone you don’t hang out with socially. Makes sense. What about the witches? Did you hang out with them? Hardly. Their blood is poisonous to us and they consider us parasites. So not a lot of mingling go on. What about Thalia? Did you ever notice her? I’m sorry. Your questions are getting pretty personal. I’m done here. Wait, Gideon! You can’t just walk out… I guess, he can. I hope you enjoyed this interview, brief as it was. To learn more, please feel free to explore my website or visit, www.soulmatepublishing.com. 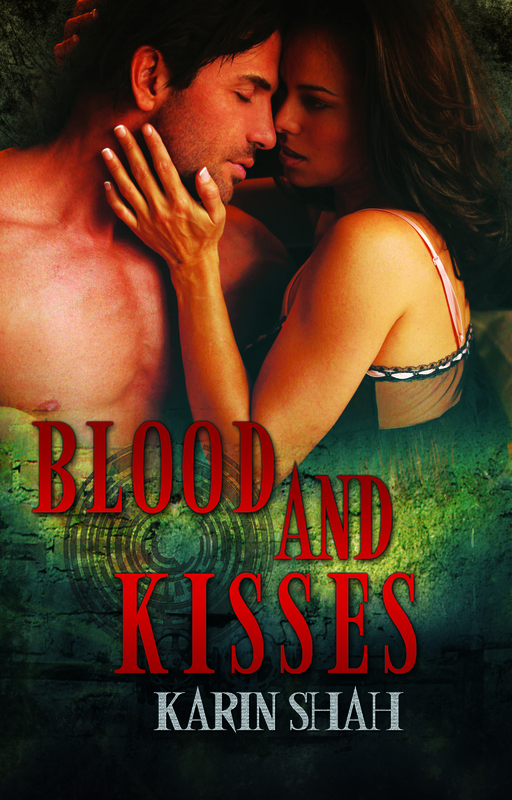 Previous BLOOD AND KISSES release day and Soul Mate Publishing Launches! Next My interview–dark or milk chocolate? Dogs or cats? Story line sounds much more intriguing than the cover portrays. Loved the interview of your character! Sounds like an awesome story. Can’t wait to read it. Best of luck on your launch! Thanks, Sheri! Nice of you to come by! I’m working on a trailer, but it’s slooow going because I can’t decide what to do. HI, Karin! Sounds great–but where is the launch party? I really liked the fact that you are using an interview of your main character to promote your new release. This was a very creative idea and a nice change from reading another author interview. Best of luck! Thank, Regina for your kind comments and for stopping by! Have a great day! Just wanted to congratulate you on your new release. Yay!! Thanks, Donna! Back at ya! Cool interview! Congratulations on your latest release! I’m sure it’s going to sell like hotcakes. Thanks so much, Marcia! From your lips to God’s ears*g*. You’ve piqued my interest! I hope the book is as amusing as the interview! That’s always the hope! 🙂 Thanks for stopping by! Congrats and good luck on the new release! Looks intriguing. That’s funny. Your hero is a little rude walking out on you like that 🙂 Guess I’ll just have to read the book to find out what’s so special about the witch. Congrats on the release. Missed this by a day, but good luck with it, Karin! Congratulations on your new release. It sounds like a winner. Thanks for your kind words! 🙂 Gideon and Thalia hold a lot of my heart and I’m glad to have a chance to share them.